The texture and color of this ice cream was absolutely incredible. It was the perfect use for my precious, freshly-picked strawberries. The ice cream recipe is from Martha Stewart Living; I included a recipe for the bonus cocktail below. Combine milk, cream, 2/3 cup sugar, and corn syrup in a medium saucepan. Bring to a boil, then reduce heat to low and simmer 2 minutes. Strain mixture into a bowl set in an ice bath and let stand, stirring occasionally, until cold, about 5 minutes. Stir in strawberry puree. Refrigerate, covered, at least 2 hours and up to overnight. Stir together remaining 1/2 cup sugar and vodka. Add chopped strawberries and macerate at room temperature at least 2 hours, or in the refrigerator, covered, up to 12 hours. Process puree mixture in an ice cream maker according to manufacturer’s instructions. When it has the texture of soft serve, drain macerated berries (reserving syrup for another use) and fold into ice cream. Transfer to a loaf pan and freeze, wrapped in plastic, at least 4 hours and up to 1 week. Combine lime juice and macerated strawberry syrup in a glass. Fill with ice and top with tonic or seltzer, as desired. I have so many delicious recipes just waiting to be shared. Before strawberry season is over, I must share new recipes that I tried with my fresh-picked berries this season. Garnish with half a strawberry, as desired. 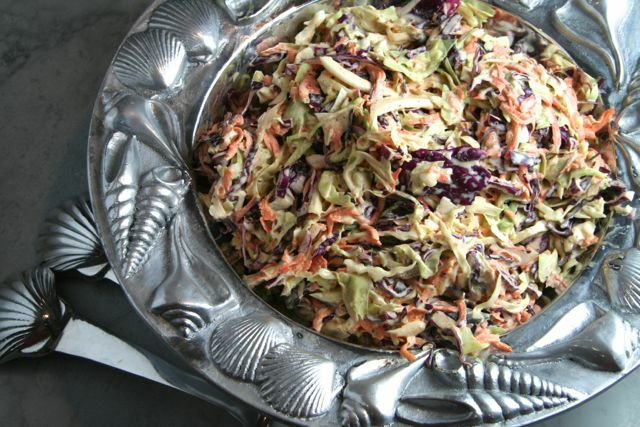 One of my good friends absolutely loves this recipe and I have had this coleslaw several times at her house. It is colorful, simple, and delicious. I served it with Slow-Cooker Barbecue Pulled Pork on the Fourth of July this year; it was wonderful in the sandwich or on the side. 🙂 This recipe was adapted from The Barefoot Contessa Cookbook, via foodnetwork.com. Fit a food processor with the thickest slicing blade. Cut the cabbages into small wedges and place horizontally into the feed tube. Process in batches. Next, fit the food processor with the grating blade. Cut the carrots in half and place in the feed tube so they are lying on their sides. Process in batches. Mix in a bowl with the sliced cabbages. In a medium bowl, whisk together the mayonnaise, mustard, sugar, vinegar, celery seeds, celery salt, salt, and pepper. Pour the dressing over the grated vegetables to moisten them. Serve cold or at room temperature. 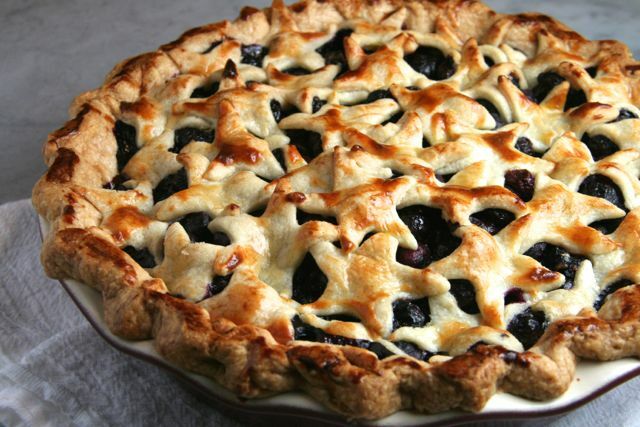 Two of our Fourth of July guests said that this was the best pie they had ever eaten- made me feel absolutely wonderful! 🙂 This pie recipe was adapted from Martha Stewart’s Baking Handbook. It is loaded with blueberries and has such a festive presentation. I was so happy to already have a small star cookie cutter from making sugar cookie princess wands! We indulged and ate the leftovers for breakfast the next morning. Perfect. On a lightly floured piece of parchment paper, roll out one disk of dough to a 12-inch round. (I cover the dough with plastic wrap.) 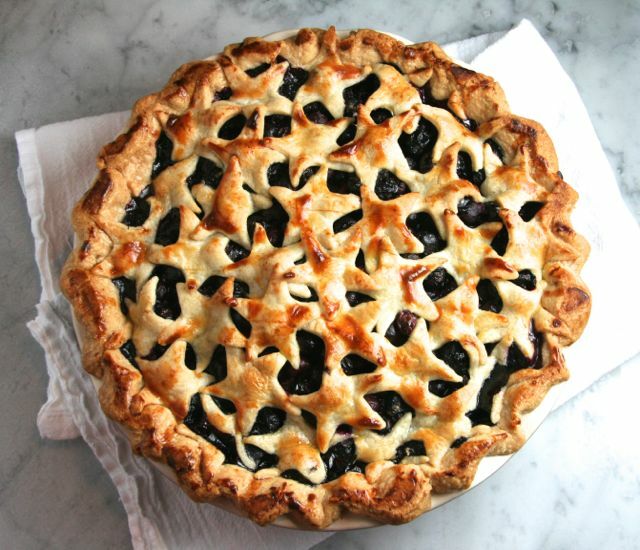 With a dry pastry brush, sweep off excess flour; fit dough into a 9-inch glass or ceramic pie plate, pressing it into the edges. Trim dough to a 1/2-inch overhang all around. Fold edge of dough under, and crimp as desired. Roll out remaining dough in the same manner; transfer dough (on parchment) to a baking sheet. Chill pie shell and dough until firm, about 30 minutes. Place blueberries in a large bowl; with your hands, crush about 1/2 cup of the berries, letting them fall into the bowl as you work. Add the sugar, cornstarch, and lemon juice; stir to combine. Spoon mixture into chilled pie shell, mounding berries slightly in the center. Dot with butter. Remove dough from the refrigerator. 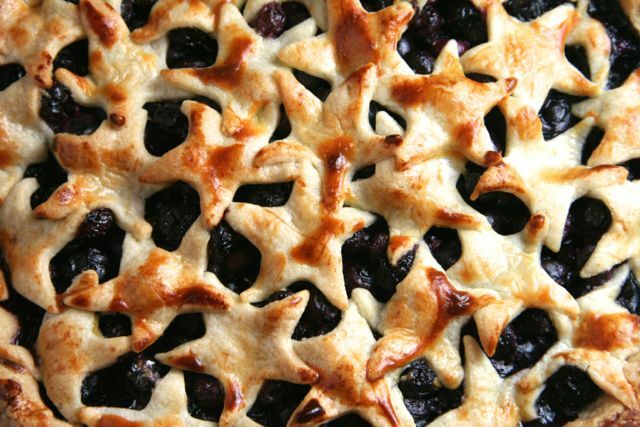 using a star cookie cutter (1 1/2 to 2 1/2-inches), cut out stars; set aside. In a small bowl, whisk together egg yolk and cream. Lightly brush rim of chilled pie shell with egg wash. Arrange the reserved stars in a circular pattern on top of the fruit (with the tips touching), gently pressing over the berries, until covered. Brush the entire surface of rim and stars with eft wash, being careful not to let it pool. Freeze (or refrigerate) pie until firm, about 30 minutes. Meanwhile, preheat the oven to 400 degrees, with the rack in the lower third. Place pie on a parchment-lined baking sheet. I cover the outer edge with a silicone pie-crust shield to prevent over-browning. Bake until the crust begins to turn golden, about 20 minutes. Reduce temperature to 350 degrees. Continue baking, rotating sheet halfway through, until the crust is deep golden brown and the juices are bubbling and have thickened, 40 (on convection) to 50 minutes more. Transfer pie to a wire rack to cool completely. The pie is best eaten the day it is baked, but it can be kept at room temperature, loosely covered with plastic wrap, for up to 2 days. With the machine running, add the ice water through the feed tube in a slow, steady stream, just until the dough holds together without being wet or sticky. Do not process more than 30 seconds. Test by squeezing a small amount of the dough together; if it is still too crumbly, add a bit more water, 1 tablespoon at a time. Turn out the dough onto a clean work surface. Divide in half, and place each half on a piece of plastic wrap. Shape into flattened disks. Wrap in plastic, and refrigerate at least 1 hour or overnight. Note: The dough can be frozen for up to 1 month; thaw overnight in the refrigerator before using.